Port Townsend, today. We noticed a “surge” in blog readership in the last two days. We were able to attribute the increase as the result of a referral by Will Van Dorp, a.k.a. “tugster” of New York City. Will has a blog “tugster: a waterblog” in which he writes about New York City’s “Sixth Borough”- the waters of New York Harbor. 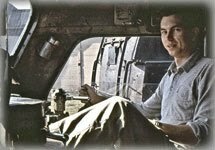 I contacted Will today and thanked him for the referral to the “Alaska Railbelt Marine” series as well as the other “Boxcars go to Sea” articles I’ve written over the past few years. 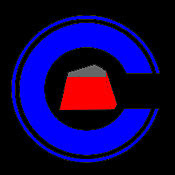 He has an interesting site which I recommend you take a look at. Apart from a difference in the West Coast reference to “rail barge” as compared to the East Coast and Great Lakes reference to “car float,” the assignment remains the same: Get those rail cars from point A to point B without dumping them in the drink! So I dedicate today’s blog to “tugster” and our neighbors on the East Coast! I expect you may be interested in railroading as well. You’ll find plenty of that here. I shot the “Guide” from the bows of the F/B Anchorage Provider while “on assignment” to do the ARM story. While my preference for what I’d call a “beautiful” tug is the “Miki” Class Light Tug (LT) built during the Second World War. I’ve posted photos of the “Comet” on this blog, she was a Miki Class, LT 393, pull-bell controls between the wheelhouse and engine room. Isn't she a beauty? She has what I call a "boaty" look about her, with that magnificant sweep from bow to stern. The new generation of “tractors” “z-drives” and now the “hybrids” are technological wonders crammed full of computer chips. The Cycloidal drive is a fascinating piece of machinery, which begs the question, How does it work? 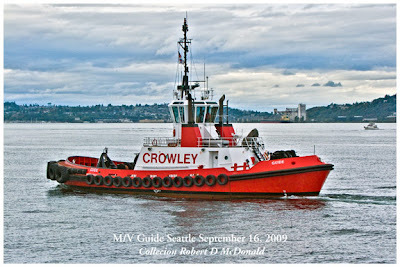 Crowley’s “Guide” was picking up speed past us going astern. You'll have fun with this simulator, which provides both joy stick and rotary control systems. 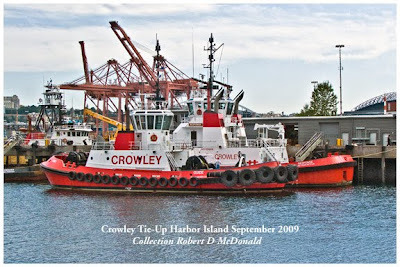 While Crowley, of all people, has the dubious pleasure of making recent headlines when the “Pathfinder” tripped over the infamous Bligh Reef in Prince William Sound, they are representative of a world class towing company. 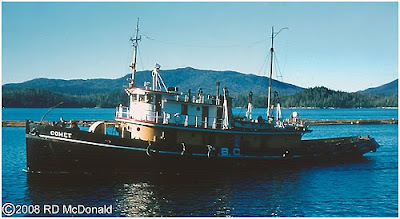 And so intertwined with my family’s maritime past and this blog, to whit: Alaska British Columbia Towing – the Prince Rupert rail barge with ABC tug Comet - was a spin off of Puget Sound Tug & Barge of Seattle, which, in turn, was owned by Thomas Crowley, then of San Francisco, now of Jacksonville Florida. robert- thanks for the salute. i'm adding your site to my bloggroll this morning. and keep up the good work. Excellent, this was QUITE a read. Thanks for putting this up, this was fascinating. So much about trains! Wow. This is like any train fanatics fantasy! Well-written and fun to read. Thanks for sharing ! Very nice blog,the way you presenting your pictures i like it very much. "Hybrids” are technological wonders. It is a mixture of multiple fuels.